Villa Sobreiro is located in the prestigious Quinta do Peru golf & country club, in the foot of Arrabida national park. Charming beaches 20 minutes away, and Lisbon at only a half an hour distance by highway of train. The 2060 sqm plot is surrounded by the golf course, has a private swimming pool and a beautiful garden with pines and cork oaks. The closed condominium offers absolute tranquillity and a 24 h reception and security service. There are mana supermarkets and restaurants in the vicinity, at a distance between 2 and 5 Km. the upper floor there are 2 bedrooms for 4 people each. Four of the 5 bedrooms have en-suite bathrooms. All bedrooms are equipped with TV. There are 2 living rooms, one in each floor. Free Wi-Fi Internet is available in all the house. The fully equipped kitchen has direct access to a terrace, where you can take your meals al fresco. There is a barbecue in the garden. The 2000 m2 garden is completely enclosed and the vegetation provides for absolute privacy. The swimming pool is 10.5 x 4 meters long. The private garage has capacity for 5 cars. Our guests can use the 5 house bicycles for free. Villa Sobreiro’s guests intending to play golf at the Quinta do Perú, will benefit from a considerable discount in the green fee. Villa Sobreiro is superbly located within the golf course. The club house with the driving range and hole no. 1 are at a distance of only 150 meters west of the villa. Hole no. 18 is abeam north of the villa. When you finish your golf, you can dive directly into your private swimming pool. The location couldn ́t be better! The club house has also two tennis courts and a restaurant with a vier over the drive range. Location in the exclusive estate of Quinta do Perú Golf & Country Club, at a close distance from Lisbon and several beaches. Enclosed property with 24/7 security services. Excepcional villa, completely equipped for 15 people. Cleaning staff. Private pool. Golf, tenis and restaurant within walking distance. 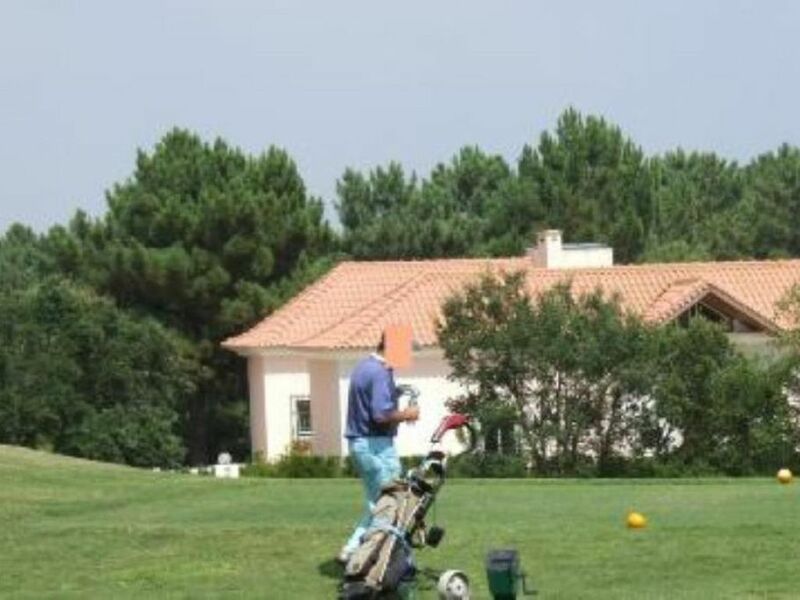 Villa Sobreiro is excepcionally well located, at a 150 m only from the club house and driving range and abeam holes 10 and 18. 50% discount on the green fee. The property was beautiful, we were pleasantly surprised at how lovely the house was. The house is very cozy and family friendly. We came late in the night and the property owner offered to make us a dinner. We were blown away by the two main courses and other delicious food they set up for us. We felt as if we were being treated as family. The housekeeper cleaned the house every other day, leaving it spotless, and always offering to do anything extra to make this house as comfortable as possible. The wifi was very fast and we never encountered any problems with it. The neighborhood is safe and peaceful. The location is conveniently close to supermarkets and any other store you might need. This house is a wonderful place to stay and we highly recommend it to anyone. Beautiful property and very spacious. Just returned from an amazing holiday at this beautiful property. The standard of the villa is very high and is well maintained throughout. The property was also kept immaculate during our stay by Anabelle who cleaned the villa three times each week. The owner met us on our arrival and provided us with welcome refreshments, following our journey. He also replied very efficiently to all our e mail's prior to our arrival. The villa is well positioned for visiting many interesting places and we particularly enjoyed Belem, Lisbon, Cascais and Sintra. We would recommend this villa and hope to be able to return again. "This is what I would call a "Five Star" Villa: The villa in it self was extremely comfortable, with high standard décor and all modern amenities you would expect from a 5star hotel. I could totally live there!! The villa’s owner was also a very polite and helpful gentleman. If you are a golf fan, I’m sure you will be very happy with the location too!! Sesimbra and Meco beach is 20 min drive away, lovely restaurants and scenery in this area. In addition, Lisbon is only 45min away, so very easy access from airport and if you fancy dinner in town. I totally recommend this place!" "We were there for a weekend to celebrate my 30th birthday with my friends, and it was the perfect choice. The house is amazing and we had the most wonderful time, its got all we could have wanted or needed, the owner was extremely helpful and kind. We're already planning to make this a regular holiday. " Masser af plads, utrolig service fra vært og rengøring, dejlig pool, ungerne elskede det. Anbefales varmt. Maison très confortable, belles prestations, grande propreté. accueil chaleureux, personnel agréable. A recommander. Take A2 motorway to the South. Leave on Exit 1 to Azeitão. Follow N10 direction Setúbal/Azeitão. After Quinta do Conde, turn right on the orange sign Golfe. Alternatively exit Lisbon through Vasco da Gama bridge. Upon crossing the bridge, take first exit to IC32, direction Montijo/Barreiro, and continue south direction A2 (SUL). About 16Km on IC32, exit on sign Palmela/Coina. Follow signs to Azeitão. Upon reaching the turnabout, leave on the second wayout, direction Azeitão. You will than find a crossroads. Turn right to Quinta do Conde. On the traffic light, turn left, joining N10 direction Setúbal. Exit to the right on the orange sign Golfe. By train, take FERTAGUS line to Coina. Than you can take a taxi. Take A2 to Lisbon and towards 25 de Abril Bridge. Take Exit 3 towards Barreiro. Immediately after the toll booth, turn right towards Coina. Follow the directions to Quinta do Conde. The property is superbly located on one of Portugal's best golf courses (Quinta do Peru), enjoying great views over the Arrábida Mountains National Park. Quinta do Peru was recently ranked 57th out of the top 100 European golf courses and yet is still a well kept secret. It is usual when playing to have anyone else in sight, it's that quiet! The Quinta do Peru Golf Course offers amateurs a pleasant game, whilst also presenting a challenge for professionals. It was voted amongst the top 10 courses in Portugal in the biennial poll organised by the European Golf magazine. The course´s recognised quality has led to its hosting several events from the European challenge Tour. There is a clubhouse with a bar and restaurant, 2 driving ranges. Surroundings:Azeitao is 30 kms south of Lisbon over the old bridge, the '25th of April'. The new bridge, 'Vasco de Gama' opened in 1998, guarantees a 1/2 hour journey to Lisbon airport and really opened up this area. The new motorway down to the Algarve and the recently opened 'Fertagus' railway line that operates from Setubal past Quinta do Conde (Coina) into the heart of Lisbon in 20 minutes have also played their part in making this area an unspoiled and uncongested alternative to the Cascais, Estoril, Sintra 'North side' area with its golf courses. Sesimbra is 20 minutes away and is the arquitypal Portuguese fishing village with some of the best fish restaurants around. If you like your fish and enjoy value for money, you can eat quality fresh fish in Setubal for as little as €5 a head. Evenings out in Lisbon are a must.